I didn’t eat donuts much growing up. There were some Dunkin’ Donuts munchkins or Krispy Kremes occasionally at school functions. When the Doughnut Plant opened I discovered the wonder of a more gourmet donut made with high-end ingredients. 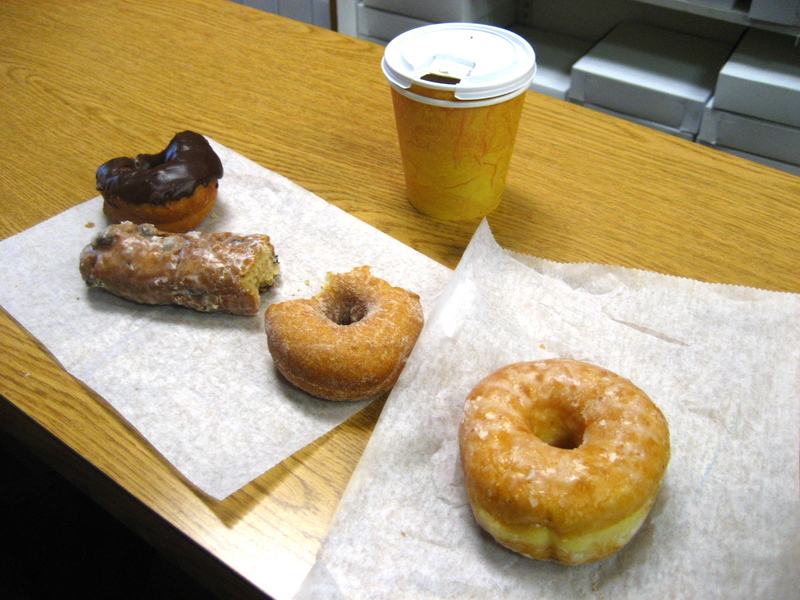 Other than those three places, I had never had donuts from a non-chain, old-fashioned donut shop. Earlier this year the Boston Globe published a list of the best donut spots in and around Boston, and most of them were the aforementioned old-fashioned variety. Having recently developed an appreciation for donuts, I set out to try most of the shops. Donuts with a Difference is located in Medford and people rave about the donuts in reviews. I actually went one weekend earlier this year but was sad to find they were sold out. Take note, if you plan to go on a weekend, go early, the donuts sell out very fast. This time I thought ahead and called before we left just to make sure they still had donuts. The shop has been around since 1984 and I’m pretty sure the decor hasn’t changed since. As a control, and because it looked delicious, we got the standard honey-dipped. 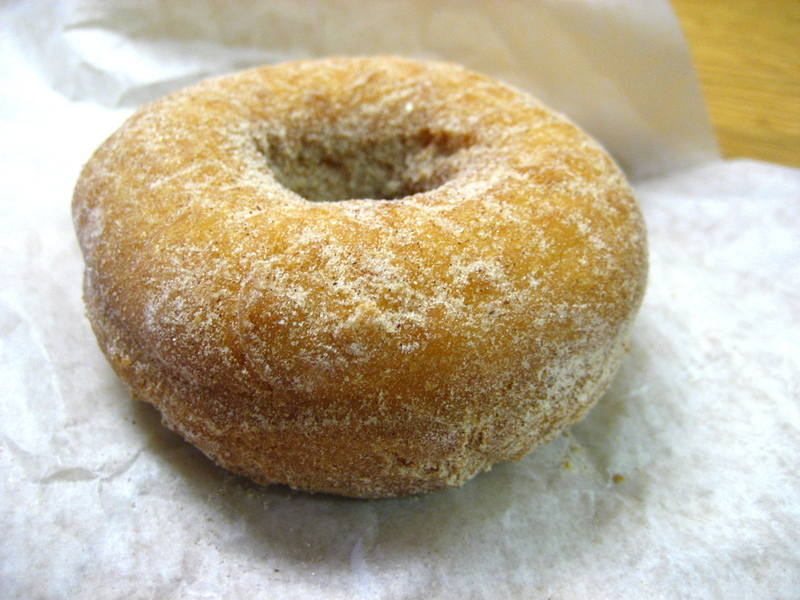 A very tall and fluffy yeast donut, it was nicely chewy and covered in a thick, sweet glaze. 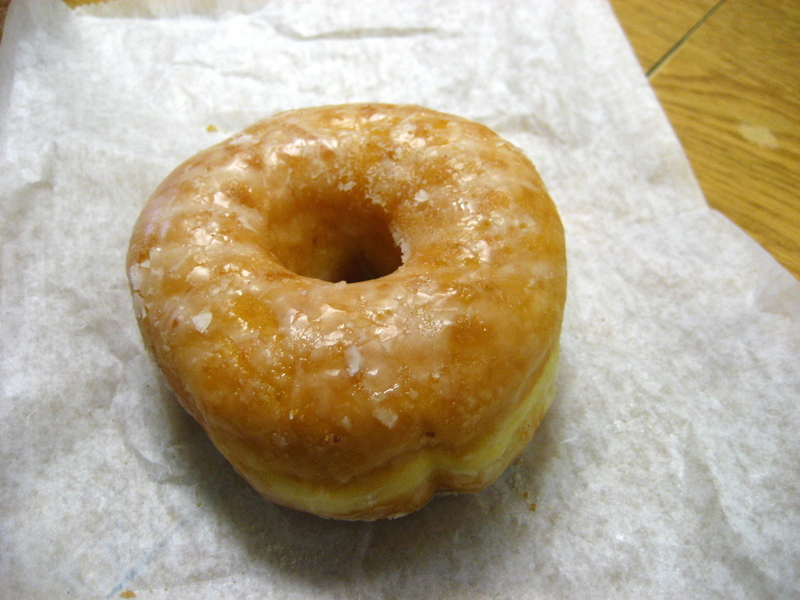 I find yeasted, glazed donuts are more prone to being overly greasy, but this one avoided that pitfall. The cinnamon-sugar was one of my favorites as these remind me of my all-time favorite apple cider donuts. This was a cake, not yeast, donut. One of the things I like about these is the thick, nicely browned outer crust. 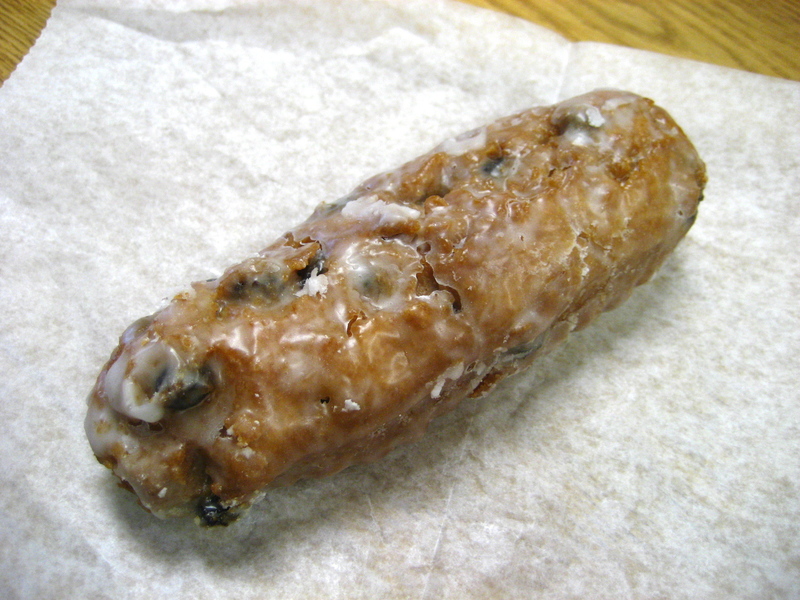 The outside gets almost crunchy in spots and is augmented by the coating of sugar. The chocolate-glazed also had a cake donut base. I usually see the chocolate-glazed variety with a yeast donut base. It was good but not my favorite. 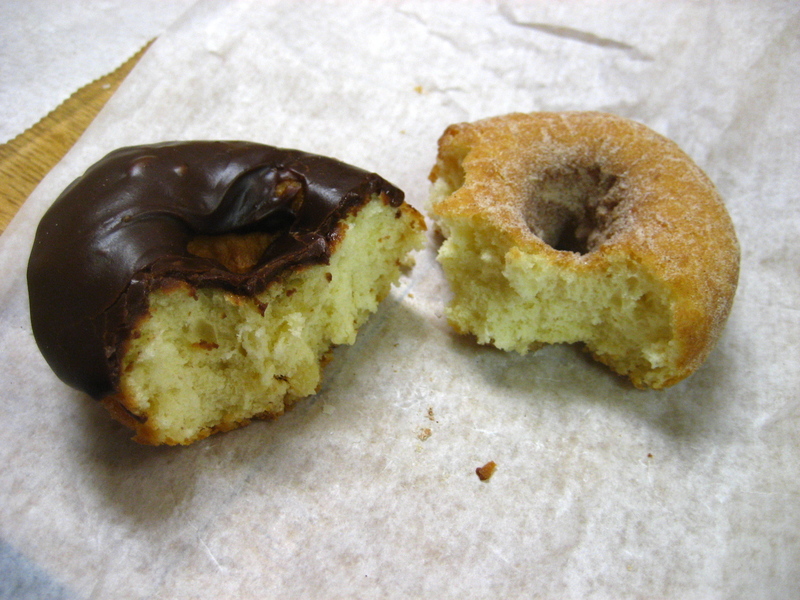 The chocolate glaze was thicker and actually a lot more like a ganache than a typical donut glaze. I’d be curious to see the glaze on a yeast donut. This beauty right here (okay maybe not beauty) is called a Gracie bar. I was eyeing it in the case and I asked the employee what it was. She replied, “It has raisins. It’s amazing, I’m just going to give you one so you can try it.” And then from behind us, a small older woman with a husky voice said, “Aw, don’t go doing that, yaw gonna give away all my Gracie bahs!” (All in good humor). Please note that that last word is “bars” said in a thick Boston accent with no trace of an “r” at the end, as we were in Medford. These thick-accented locals are what comprise the majority of Donuts with a Difference’s customer base. The employee said that she doesn’t even like raisins but she likes the Gracie bar. I do like raisins so I had high expectations. It was a cake donut so it already had that toothsome outer crust I like, on top of which was a thick glaze. Coating is probably a more appropriate term. The inside was not the standard cake donut. It was more buttery with some swirls of cinnamon and studded all around with raisins. It was quite wonderful if not a tad overkill in terms of sweetness. A slightly less sugary glaze and it would be perfect. As is, by the time you near the end of finishing one, you can definitely feel you’ve filled your sugar quota for the day. The other great thing about these longstanding Boston donut shops? The prices. Each donut costs 95 cents. I’ve only tackled a few of the donut shops on the list thus far, but Donuts with a Difference is already ranking high. If you are a donut fan, they are worth a try, but go early in the day, otherwise all the Gracie bahs might be gone. I’d rather see that chocolate glaze on a yeast doughnut too. The cinnamon doughnut sounds good. I love that crunchy exterior too. You go to all the best places! Haha, love the Gracie bahs comment! This post is making me want to walk next door to Dunkins… but I’m guessing their donuts would pale in comparison to this place! I wish I hadn’t read this on an empty stomach! I second Emily’s emotion – so tempted to head over to Hi-Rise for some pastry goodness. 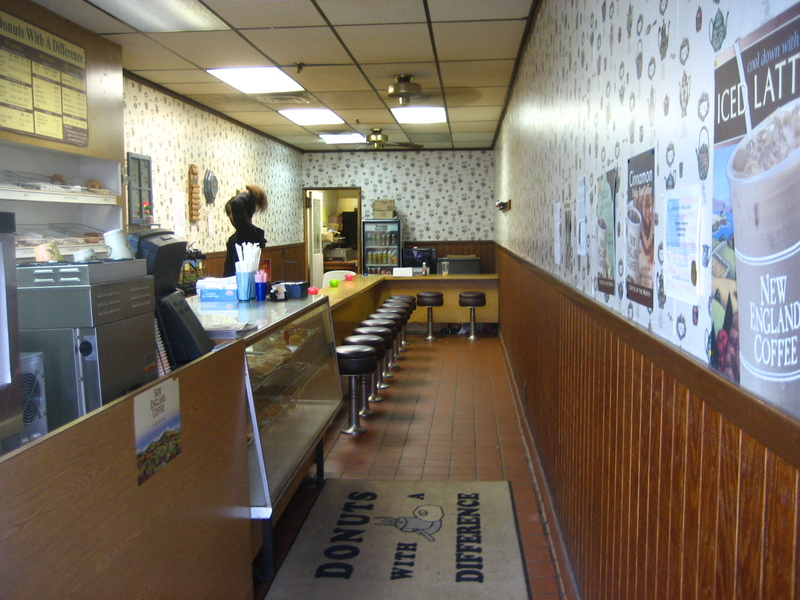 You have got to try Donna’s Donuts in Tewksbury. I don’t even like donuts but I love this place. Perhaps we can amend our ice cream date to an ice cream and donut date? Do we dare? I love donuts (and I ate a lot growing up) and love to try new ones. Thanks for the tip! You are like a donut expert! SWOON. I rarely eat donuts but for ones like these…I’d make an exception. There’s some gourmet donut place here in NYC that makes all kinds of crazy flavors…we should continue the taste testing there the next time you’re in town! I didn’t eat many donuts as a kid either–if I did it was usually some Dunkin Donuts, but what a find! And great descriptions. Donuts in my mind are just “yum”. I love so many things about this shop. There was no need to explain that lady. I’ve never met her but I know exactly who she is! and I need a gracie bar please.